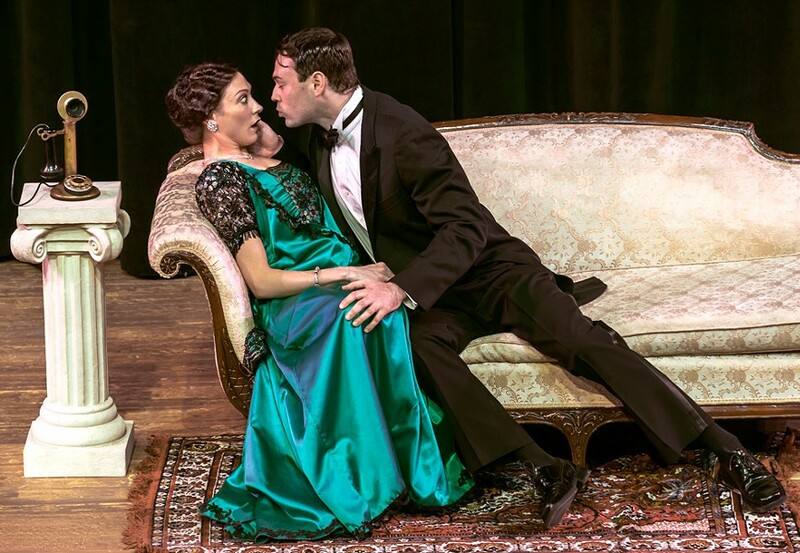 PHOTO BY STEVEN LEVINSON Brynn Lucas and Jake Purcell in "Funny Girl," now at the JCC CenterStage. UPDATE 5/10/13: The JCC has announced that, due to popular demand, an additional performance has been added to the run on Sunday, May 19, at 7 p.m.
You can understand why a community theater would want to revive a fondly remembered musical like "Funny Girl." It ran for more than 1300 performances when it first opened in 1964, thanks to a strong dramatic score by composer Jule Styne and lyricist Bob Merrill (despite some amateurishly clumsy wording in some of the songs) and a star-making performance by a young unknown named Barbra Streisand. Isobel Lennart's book purports to tell the story of Fanny Brice, a beloved comedian and singer who had died only 13 years earlier. Today, an audience remembers, if not Brice, then Streisand's bravura performance in the 1968 movie adaptation from its countless reruns on television. The book begins with Fanny, a star-struck teenager living with her working-class mother near their Brooklyn saloon; the real-life prosperous but drunken father does not get a mention. Much of the story plays fast and loose with the facts so it can romanticize Brice's life from her achievement of stardom, to her successful wooing by gambler Nick Arnstein and their parting after his imprisonment for embezzlement. Acceptable dramatic license, I guess, and even though Fanny necessarily gets to affirm her indomitable courage at the end, the finale is greyer and more shadowed than audiences were used to in such conventional fare. Post Stephen Sondheim, we take that sort of thing in stride. But the same bag that contains a revival's advantages also shleps its pitfalls, and they are on full display in the CenterStage production currently playing at the Rochester JCC. "Funny Girl" is an old-fashioned vehicle, a non-stop star turn for a performer who can walk onstage and, until the final curtain, command the attention of the audience through the insistence of her personality and the force of her talent. Think Ethel Merman. Even think Barbra Streisand. Instead, this production offers us the likeable, talented Brynn Lucas, who is no Streisand, though much of her performance tries to imitate her predecessor's authoritative belting and gamine-like awkwardness. She never escapes the burden of Streisand's definition of the character. Despite the fine songs Styne and Merrill wrote for Fanny — "People" and "Don't Rain on My Parade," among others — Lucas also has a tendency to go flat whenever she starts to belt. The book calls for Brice to mug whenever she feels self-conscious or inadequate — and she feels that way a lot. But Lucas consistently overplays the already mannered dialogue and has little feel for comedy. She just isn't especially funny. Part of the problem might lie in the fact that the story and its songs are so familiar that the comic production numbers featuring a pregnant bride and a soldier with a Yiddish accent aren't surprising anymore. The book, sprinkled with bits of dialogue and business designed to get laughs, rarely got more than an occasional titter. Likewise, in the story's most dramatic moments — the collapse of Fanny and Nick's marriage — I felt little connection to them or between them. What you ask of a community theater doing a large musical is not what you ask of Broadway or even Geva. If the leading roles are good, you try to be flexible about supporting roles and production numbers. But Jake Purcell as Arnstein was stiff and unconvincing; there was little believable emotion between him and Lucas. Ed Popil hoofed gracefully as Fanny's friend, Eddie Ryan, and Mary Krickmire as her mother got most of the laughs. Despite the limited budgets that many local theaters struggle with, Peggy Zorn's costumes were too often ill fitting, and saddle shoes just won't do as a substitute for spectators. The production lists no set designer; the anonymous work was adequate in a minimal sort of way — a table and a few chairs to suggest an apartment; a sofa, table, and grand piano to suggest a large house. Beth LaJoie's lighting was properly gaudy during the production numbers and straightforward the rest of the time. Although "Funny Girl" is a conventional musical — just the sort of thing you expect a community theater and its audience to embrace — director Ralph Meranto's production never sparkles. It lacks lift. And therein lies the mystery of theater. Last time out, CenterStage mounted an extraordinary production of a much more difficult work, Tracy Letts' "August: Osage County." This time around, with something that sits square in the palm of anyone who has ever wanted to go out on stage to sing a note or tap a toe, the result is a little too close for comfort to being merely mediocre.